Water tanks for Motorhomes, Campervans, Caravans, Horseboxes, Race transporters and Narrowboats. 300 individual sizes with many designed to fit standard panel vans with pre designed kits for easy DIY installation. For individual tanks hose fittings can be installed to tank by us to your supplied drawing during manufacture, or you can have the tank with a access cap or hatch to install our nut in fittings yourself. We have specialised for over 40 years in the manufacture & supply of water storage systems for original equipment and aftermarket installation. We developed the first plastic water storage tanks for Caravans, Motor-Homes and Marine applications, with our own revolutionary designs and patented C.A.K Tanks Anti-Surge Baffles.Years of continuous design, development and manufacture have formulated the renowned quality and reliability of C.A.K. Tanks Water Storage Systems. THIS LIST IS NOT EXHAUSTIVE; MANY OTHER TANKS WILL FIT IN OTHER POSITIONS. THIS MAY SUIT YOUR CONVERSION BETTER. ABOVE LIST IS FOR GUIDANCE ONLY. PLEASE MEASURE TO ENSURE THE TANK YOU ORDER WILL FIT YOUR VEHICLE AS MANY VEHICLES ARE MODIFIED FROM STANDARD, OR, MANUFACTURERS MAKE BASE VEHICLE CHANGES IN PRODUCTION. 203 T5 WASTE (W) – 46 lit (14) CENTRE REAR IN FRONT OF SPARE WHEEL NOT SYNCHRO. When ordering tanks that you require us to put hose connections on the tank (Excludes ATS tanks) we require a Drawing to identify where you want connections. You must order item TANKDRG to notify us or if not ordered with tank, tank will be despatched with no connections fitted to it. Our one piece heavy duty polyethylene moulded plastic tanks (wall thickness from 4 mm to 12 mm depending on size) can be fitted with our welded hose fittings during production to suit any application or requirement at no extra cost. Our tanks are designed for the safe, reliable storage and transport of drinking water & grey or black waste water, industrial chemicals and much more (not designed for petrol or paraffin fuel storage). They are available in a wide variety of shapes and sizes; we offer the most extensive range of 250+ sizes. Every effort is made to ensure Tank sizes and capacities are accurate, but due to the production process variations can occur. Rotomoulded to be seamless, one-piece, watertight vessels, our tanks will not leak, split, rust or corrode. All our tanks are manufactured to meet the requirements for food and water collection. All our tanks are moulded; they are not welded together from flat sheet plastic with joins that will crack prematurely. The tanks are black to prevent the growth of algae so your fresh water will stay fresh longer with no aftertaste. Don’t be put off by the colour we only use the highest grades of virgin polymers to produce our tanks. Being black no light can enter to the water and therefore no algae and other organisms can grow therefore there will be no bad tastes, your fresh water will stay fresh longer. It is important to use food quality hoses as most water tastes come from the waterborne chlorine leaching plasticizers out of the flexible hoses, leaving a medical/plastic taste (blue hose syndrome). 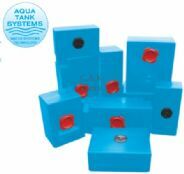 Most of our smaller tanks have anti surge baffles; a C.A.K. TANKS patented Invention, to prevent excessive water movement. Being moulded and having no joins ensures a long and trouble free life. We cannot make tanks to individual made to measure sizes as all our tanks require a mould. For bulk requirements of 100 items a mould could be made. Welded hose fittings in a position to suit your requirements. Welded hose fitting sizes available:- Straight fittings 40mm, 1 1/2”, 1”, 3/4”, 15mm, 1/2”, 12mm, 10 mm. For individual fitting requirements please send sketch of drain tap & hose fitting positions with order. See reverse of order form. We do not take verbal instructions for the positioning of tank fittings, WE MUST RECEIVE A SKETCH OF THE POSITIONS. See price list for guidance on what information is needed on your drawing. Nut in fittings are at extra cost. Level indicators, hatches & sub pump adaptors can be fitted to black tanks while in production at no extra charge for labour. The tanks appear in the catalogue (you can download a pdf catalogue from the tabs above) in length order with longest size first. Firstly look in the vehicle applications table to see if your vehicle is listed. If it is, you must measure to confirm the tank will fit where it is intended to go. Many vehicles are modified in some way from the manufacturers’ standard that could prevent the standard tank from fitting. If your vehicle is not in the list, find the maximum length you have and work through the catalogue tank lists to find the best tank shape to fit your available space. Although tanks may be marked F or W (Fresh or Waste) they can be used for both applications, but you will need to inform us how you intend to connect the tanks. Our tanks cannot be used for petrol or diesel. Year information: <98 means up to and including that year, 98> means that year and after. 1. Carefully measure the available space (length, width and height) whether it is under the chassis, in a bed box etc. where you plan to install your tank. Since these tanks are generally rectangular in shape, keep in mind they may be used in any position, though if placed up on edge, they will need bracing and supporting. 2. Remember that most of our tanks are one piece sealed mouldings. This means there are no predetermined access holes. If you want to fill and empty the tank, which we assume you do, you will want to select fittings and accessories that are appropriate for your project. See our entire selection of tank fittings, filler caps and lids, in our catalogue. Tanks marked FRC, RRC & MTC have the option of our fully sealed cap at a specific position on the tank. If you require an access cap in the base of your tank only tanks with RRC are suitable, unless you specify our 10” hatch THSO10 to be installed. No other caps or hatches are suitable to be installed in the base. 3. Once you have selected the fittings that are necessary to complete your project, fill out our Order Form. And enclose a suitable sketch drawing for tanks where you wish us to place fittings in a non standard application. You can of course order the tank plain and order separately an Access Cap / Hatch and a selection of Nut In Fittings to assemble the tank yourself. 4. It is very important to be as precise as possible when specifying tank fittings and accessories. Location, type and size of fittings must be noted clearly on your drawing. If more than one fitting is being specified, mark each fitting with a letter A, B, C etc. and identify the size and use of each fitting next to your drawing. Ie. 40mm Filler, 10mm vent/breather/overflow, 15mm Pump connection and 25mm drain connection. See back of order form for sizes available. Dimensional drawings are available for all tanks in the catalogue. Copy and enlarge a drawing and send or fax in with your order. Mark tank drawing top, front, back, side & bottom to identify which way up you are using tank. Indicate width, length and height of tank using inches or millimetres. Plan View: indicate the distance of the connection from edge of tank. Elevation View: indicate in inches or millimetres the height from the centre of the fitting to the base of the tank. Or mark connection as low as possible.Example: 36” long x 24” wide x 36” High. Fitting is 18” in from end along the 36” sidewall, 18” up from base.